This backpackers property is located in the heart of El Chalten with a panoramic view of the Andes mountains. The property offers guests comfortable rooms, cooking facilities, laundry, library, living room, internet access and local information. You can book trips and trekking tours to the Andes from the property. We have three shared rooms for 6 people, five shared rooms for 4 people, and nine double private rooms. The main difference from the rest of the properties is that we have private bathroom in all bedrooms. 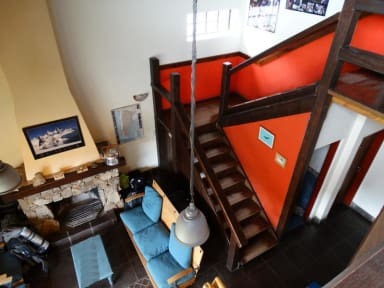 The property has a large and well-equipped kitchen for guests, a large dinning-room, living-room with a fireplace, a library with book exchange, laundry service, breakfast and meals. The town is sorrounded by mountain chains, lakes and glaciers. Super nice and helpful with planning backpack trip/food/laundry services/etc. Great hostel, simple breakfast but fantastic location and well organized. 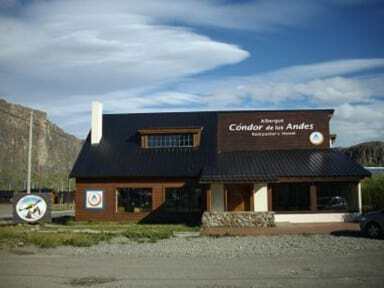 We loved Condor and stayed there 4 nights. The atmosphere was very chill, the rooms and bathrooms were clean and the staff was very hospitable. The guests were very respectful and there is a general feeling of trust. Cóndor is located very close to the town’s entrance, which is rather far from the main trail entrances to Fitz Roy and Laguna Torre. However, it is close to lesser traversed trails for Pliegue Tumbado and Mirador de los Cóndores. We would recommend staying here. Beautiful place 5 minutes walk from the bus station and town. Good heating and hot showers. Great atmosphere and staff, always clean. Kitchen was small so could get busy, but otherwise a fantastic hostel. + the rooms were very comfortable and clean. Friendly staff. Good location - wifi was slow and the signal doesn’t reach in the rooms I would definitely recommend it! Nice hostel close to the bus station and other attractions, rooms are comfortable and warm. The kitchen is fine but gets busy at times and the breakfasts supplied by the hostel are nice. Staff are helpful and the hostel get a wide range of people, ages and nationalities so that makes it interesting. The WiFi is only in the common area. We liked the cosy 4 bed dorms. Breakfast good and starts early. Staff were nice and friendly and let us leave our bags at the hostel while we did a hike. Location is close to the bus station but about a 15m walk from trail Could be more sockets in the room and they're far away from the bed. And finally, as other reviews have mentioned, WiFi is exceptionally poor, both reception (we couldn't get it reliably in our room) and speed. Bear in mind mobile signal only works for Movistar in El Chaltén. Very polite staff. Clean. Good location only 2 blocks from bus station. Wifi went out for a night, but considering how remote El Chalten is this not such a surprise.